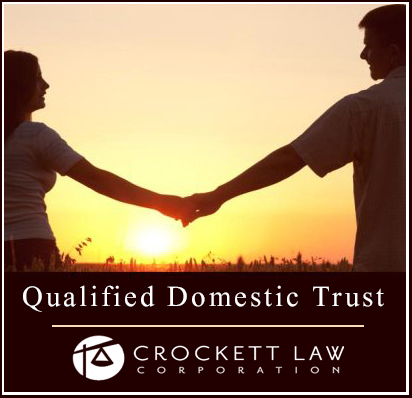 A Qualified Domestic Trust (also known as a “ QDOT”) is type of trust established where estate property passes to a non-U.S. citizen spouse to allow a marital deduction on the death of the first spouse. A QDOT allows the amount transferred into the Trust to qualify for the estate tax marital deduction. Without a QDOT, assets transferred from a decedent to a spouse who is a non-U.S. citizen do not qualify for the marital deduction on the decedent’s Federal Estate Tax return, form 709, and thus get taxed on the death of the spouse who is a U.S. citizen. For a trust to qualify as a QDOT, the trust instrument requires that at least one trustee be a U.S. citizen or a domestic (U.S.) corporation and that no distribution of trust principal can be made unless that trustee has the right to withhold the tax imposed on QDOTs. A QDOT is authorized under the IRC §2056(d) and regulations thereunder governing the marital deduction for property passing to a surviving spouse. The purpose of the QDOT from the standpoint of the government, is to insure that estate taxes get collected on distributions of trust principal/corpus during the life of the surviving spouse or at her death. Andy Smith, a U.S. citizen, is married to Jane Smith, who is not a U.S. citizen. Andy dies with an estate of $6,000,000. In his will or living trust, he leaves his entire estate to Jane. If Jane were a U.S. citizen, the marital deduction would be allowed on Andy’s estate tax return, form 706, and his entire estate would pass to Jane free of estate tax. However, since Jane is not a U.S. citizen, the amount passing to Jane above the estate tax exemption of $5,325,000 would be assessed estate tax of $236,250. ($6,000,000 minus the $5,325,000 exemption equals $675,000 taxable times 35% rate = $236,250 estate tax). To avoid this unfortunate result, Andy’s will or living trust could contain a QDOT and if so the marital deduction would be allowed so there would be no tax on the portion of Andy’s estate passing to Jane. When Jane dies, the QDOT assets remaining will be subject to estate tax. Also, during Jane’s life, if she makes certain types of distributions from the trust during her life, (distributions of trust principal with some exceptions) estate tax is assessed and paid on IRS form 706-QDT. Save estate taxes on death of first spouse. The assets controlled by the QDOT are allowed to be used for the marital deduction on the federal estate tax return, form 706. Thus where the surviving spouse is a non-U.S. citizen the transfer of assets into a QDOT allows the non-U.S. citizen spouse to have the same estate tax advantages of a spouse who is a U.S. citizen. As a result, there is no estate tax assessed on the assets placed into the QDOT on the death of the first spouse. When the surviving spouse dies, the assets remaining in the QDOT will be subject to estate taxes on the surviving spouses’ federal estate tax return. Also, certain distributions made during the surviving spouse’s lifetime are subject to payment of estate tax. The trust must be established under and governed by the laws of a state of the United States or the District of Columbia or be made specifically subject to those laws. The trust can be established before the death of the first spouse to die or it can be part of his/her Will so that it gets established and funded as part of the estate administration and becomes an irrevocable trust. The trust must constitute an ordinary trust and cannot be any other type of entity such as a corporation or LLC. Basic trust provisions. 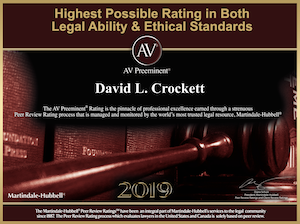 The trust must qualify for the federal estate tax marital deduction under §2056(b)(5) which is a life estate in the surviving spouse with a power of appointment OR §2056(b)(7) which is a qualified terminable interest property including joint and survivor annuities under section 2056(b)(7)(C) OR section 2056(b)(8) where the surviving spouse is the only noncharitable beneficiary of a charitable remainder trust OR meet the requirements of an estate trust as defined in §20.2056(c)-2(b)(1)(i) through (iii). In other words, the QDOT must have the same basic provisions of any other trust which qualifies for the marital deduction. Additional trust provisions for QDOTs with $2 millon or less in assets. This size of trust must have as its trustee an individual who is a U.S. Citizen and whose tax home is in the United States. Also, the trust instrument must provide that no more than 35% of the fair market value of the trust assets determined on the last day of the taxable year can be real estate assets located outside of the U.S. Alternatively, if the 35% rule is exceeded that trust can instead comply with the requirements for QDOTs with over $2 million in assets. Additional trust provisions for QDOTs with over $2 million in assets. This size of trust must have either a S. Bank be the trustee, OR post a bond in favor of the IRS in an amount equal to 65% of the fair market value of the trust assets OR provide a letter of credit in favor of the IRS in an amount equal to 65% of the fair market value of the trust assets. Also, a U.S. branch of a foreign bank may serve as the trustee if the bank alternative is selected. The exact wording to be used for the bond or letter of credit is specified in the IRS regulation. §20.2056A-2(d)(1). Measurement of the $2 million in assets. This is a very complicated subject that has detailed regulations about how the computation is done. Up to $600,000 in value of the principal residence including furnishings actually used by the surviving spouse is not counted toward the $2 million benchmark. Funding. Once the QDOT Trust is prepared, and before funding, the QDOT must obtain a federal tax id# just like any other irrevocable trust. Then a trust bank account must be opened and the the assets in question must be (a) actually transferred into the trust before the date the federal estate tax return is due which is 9 months after the date of death of the spouse or (b) the property is irrevocably assigned to the trust under an irrevocable assignment made on or before the date the federal estate tax return is due. Ongoing. Detailed records and annual determinations of value must be made in order to comply with the tax reporting requirements. ment will be filed as an attachment to the return and will be examined in an estate tax audit. Typically, nearly all estate tax returns in Orange County are audited. The auditor will examine the QDOT records in detail and all must be in order and up to date or the assets contributed to the QDOT will be drawn back into the estate and be taxed. Annual return (form 706-QDT). This return is filed every April 15 and reports in detail the finances and distributions made by the trust during the prior year. Estate tax is payable on any distributions of trust principal/corpus made during the year except for payments made due to hardship. This return is detailed and complicated and may involve first obtaining appraisals of properties involved. Fiduciary income tax returns (forms 1041 and 541) are required to be filed by April 15 of each year to report the income of the trust. This is no different from any other irrevocable trust. The information in this memo is for general informative purposes and may not fit every situation. You are cautioned to have any QDOT situation thoroughly reviewed and appropriate documentation prepared by legal counsel before you actually commit to it. The tax laws and IRS regulations are constantly changing in this area. Strict compliance with the required notices and the filing of tax returns and other administrative requirements are essential to be able to claim the tax benefits of a QDOT.